Launched in 1958, the Edmund Fitzgerald was the first of the Lakers to exploit the enlarged locks that previously restricted length to about 610 feet and beam to about 60 feet. At 729′ long, with a beam of 75′ and cargo capacity of 25,000 tons, the Fitzgerald soon set records for tonnage and performance. 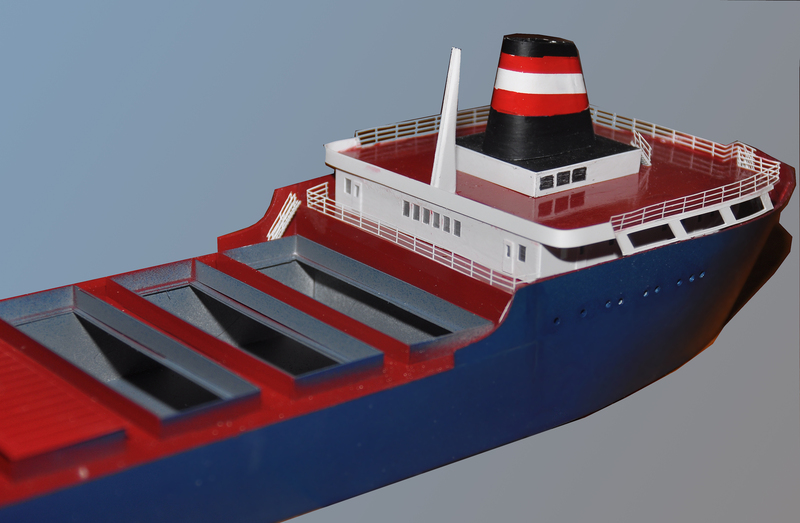 Modeled here is the Algosteel, a 735′ sister ship with one added deck forward for luxury suites. The model is 55″ long and 5.625″ wide. Many were fitted with self-unloading mechanisms with a reach of about 250′, and conveyors in the holds. This allowed the Lakers to offload at virtually any facility where there was sufficiently deep water. Many of the class are still operating. The model has 22 correctly sized and spaced hatches, as well as the traveling hatch crane. The self unloader takes up one hatch. The hatches can be modeled either open or covered.The model features custom photo etch railings and stairways, and many custom-built details, including windlass, winches, deck ventilators, quadrant davits, life boats, skylights, accommodation ladder and much more. The models are available in both N and Z scale. Shown here is a N scale model completed in late 2016 for a railroad planning an unloading site without cranes. Prices without the self-unloader are $2350.00 for a completely built model and $575 for the kit. Both built-ups and kits are assembled on an as-ordered basis, so there will be delays in shipping. The kits contain a large amount of sheet styrene (and brass), and are not recommended for beginning modelers. These will only be sold to customers who assert that the hull construction and the cambered hatch coamings and hatch covers are within their modeling capabilities. Insurance and shipping are additional charges.